We mutually agreed upon a theme, menu, and a date. With the main details out of the way, we both knew we couldn’t do a dinner party without a craft. :) This craft needed to fit the theme, but could be anything from drink stirrers to table decor. The fun part? This craft would be done in secret and then shipped to each others doors before the agreed upon dinner party date. SURPRISE!!! 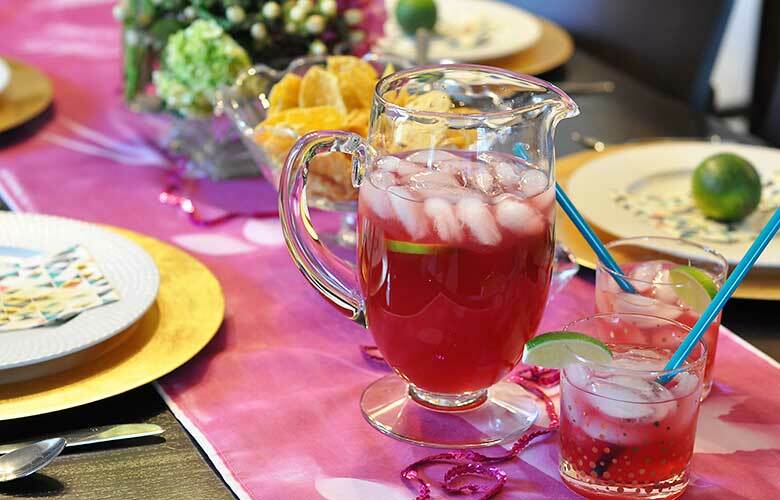 What would be our first Virtual Dinner Party theme? FIESTA!!! OH MY GOODNESS! SO CUTE! She made me a beautiful pink table runner using Incodye! The funny part…I made her a table runner too!! Crafty minds think alike. 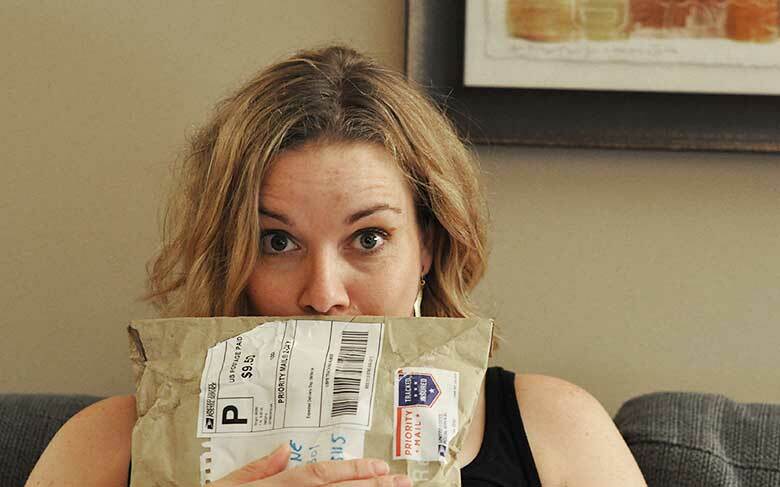 Check out her side of the dinner party here on A Bubbly Life. After setting the table with her amazing runner, I dialed up Laurel on Skype to meet her “face-to-face” for the first time! It was so fun talking to her in real time. We chatted for awhile, showed each other our set ups for dinner and then sat down to enjoy our food. 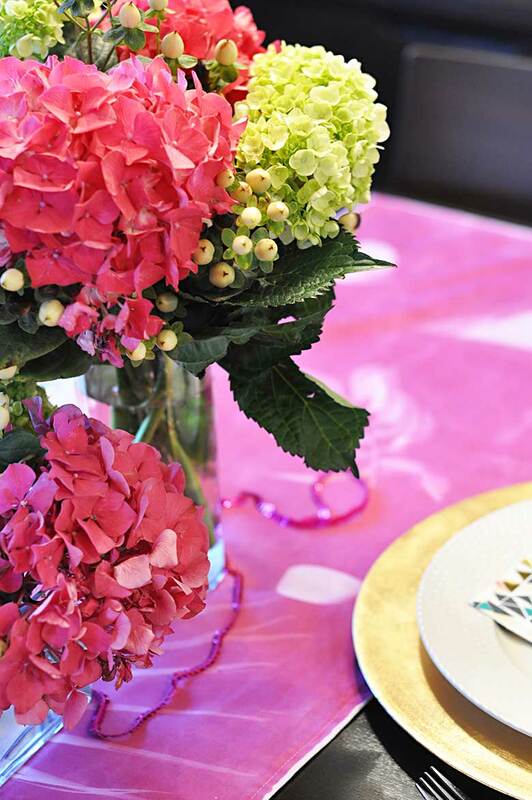 Here is a shot of her signature color runner which I matched with some beautiful pink hydrangeas from Whole Foods. 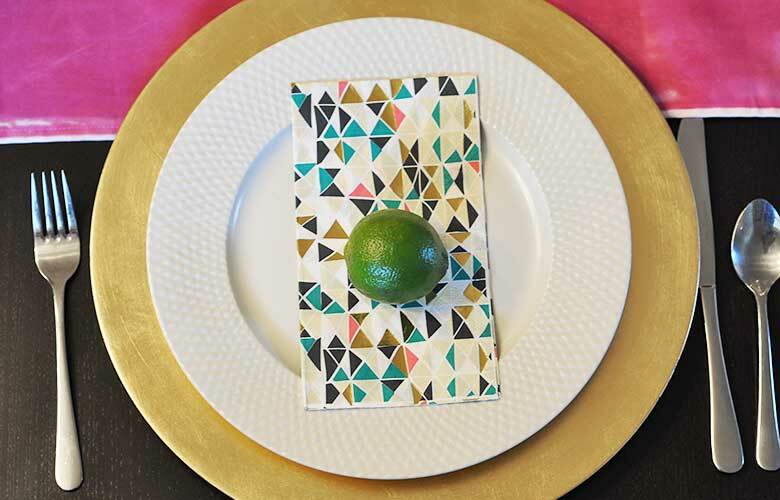 For the place settings I paired up my newly purchased Oh Joy for Target geometric napkins with some gold chargers, and topped it off with a lime to bring out the green! I used my new Gold Confetti Tumblers from Paper Source, and filled them with Food & Wine’s Pomegranate Margarita recipe. Boy were they strong…but ohhhh so tasty! Now for the food. 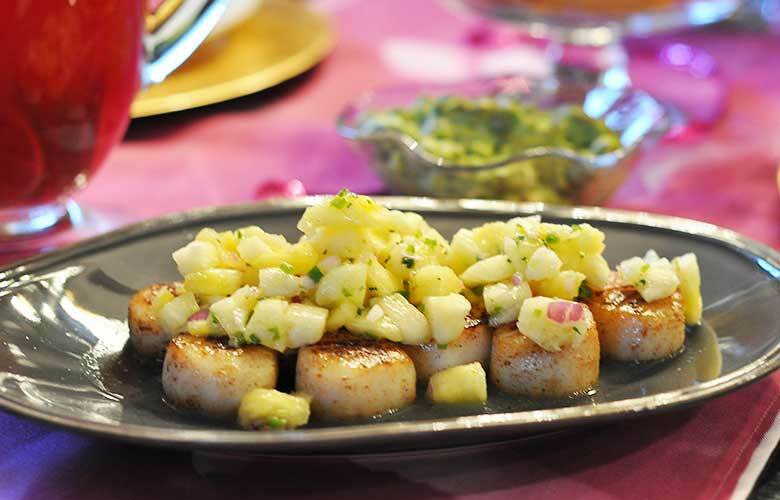 The main dish and the star of the evening, Seared Scallops with Pineapple Salsa. This recipe came directly from Laurel and it’s freaking fantastic. I will definitely be making this again. 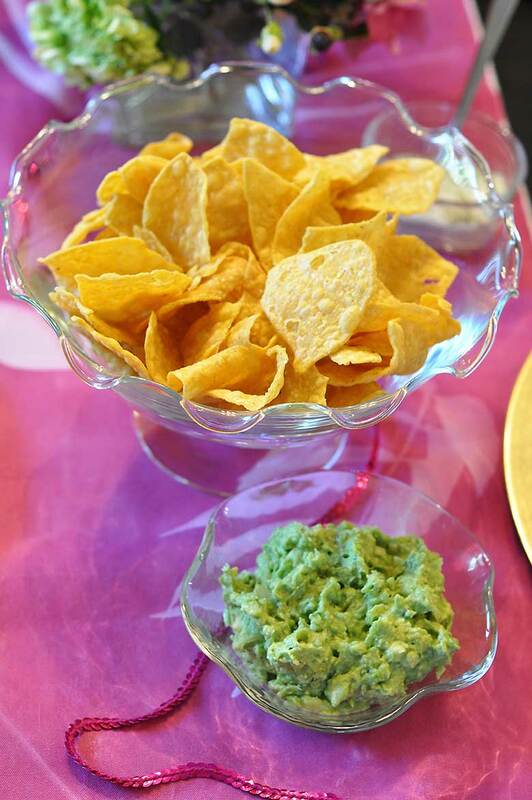 And how can you have a fiesta without chips and guacamole? A few hours to make the pom poms, and approximately 30 minutes to complete the table runner. 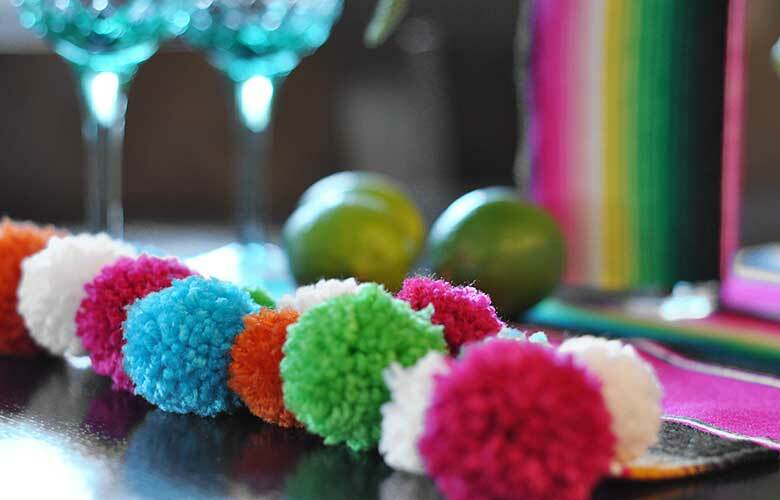 If you haven’t tried making a pom pom with a Clover Pom Pom Maker…you are missing out! They are fantastic!! If you don’t have one, then make your pom poms however you feel comfortable. It’s important that when you tie off your pom pom, use a longer piece of yarn and don’t trim it when you trim your poms. 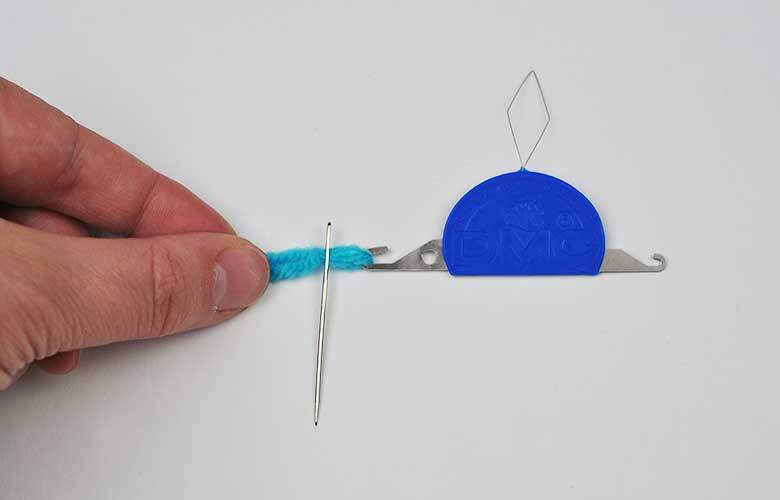 You will use this yarn tail to attach it onto the end of the serape. 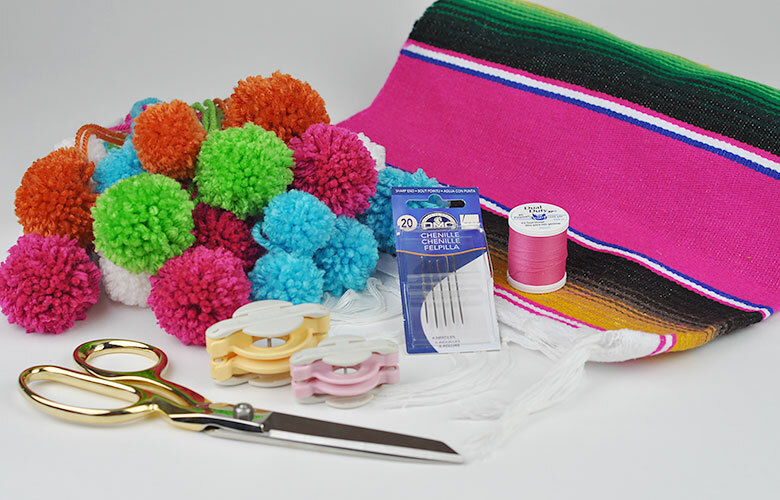 Also, make various colors and sizes of your pom poms. 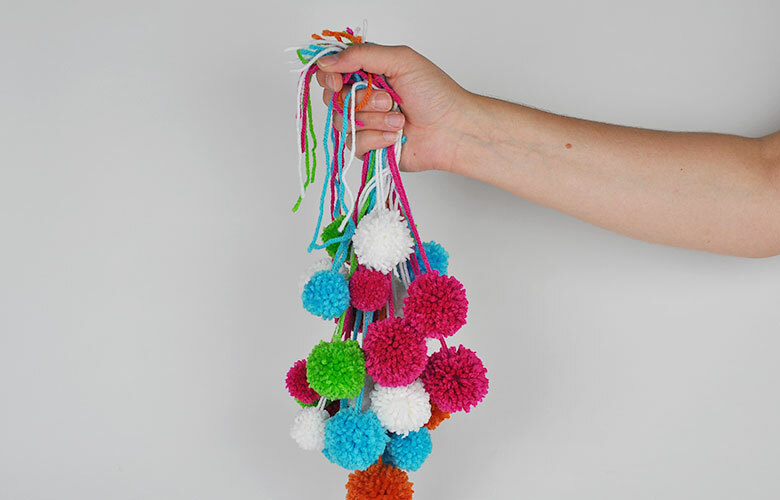 I made 14 small, and 14 medium Pom poms in a random assortment of 5 different colors. This serape had a black ornament in the center, so I folded each of the long sides in, and cut off a 1/4 off each side. 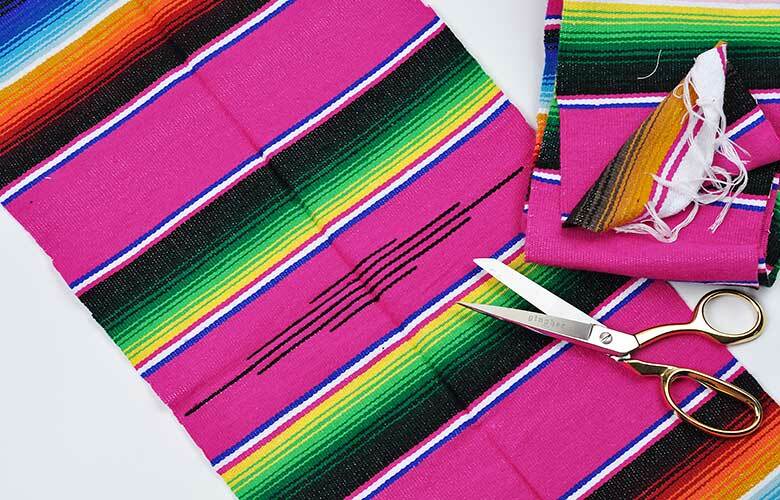 Iron out your newly cut serape, and trim off any rough edges. 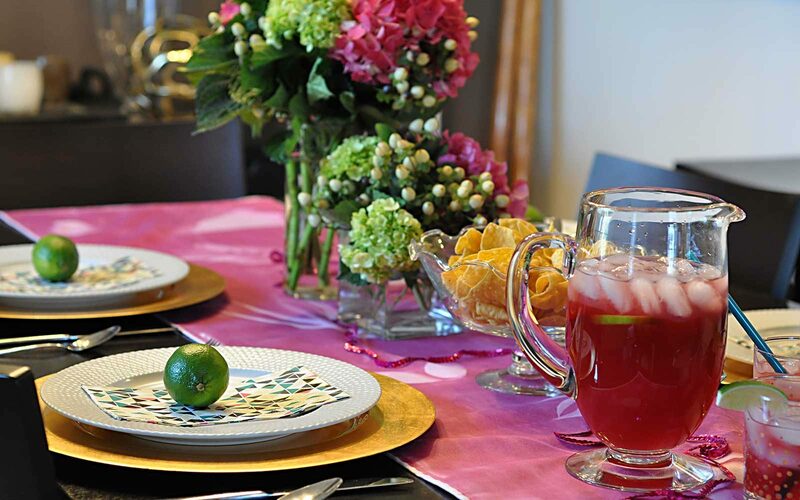 Tip: Use your trimmings to wrap around a vase for the centerpiece, or make into napkin rings! Sew a 1/4″ seam along each long edge. When you are finished sewing, iron out the seams. 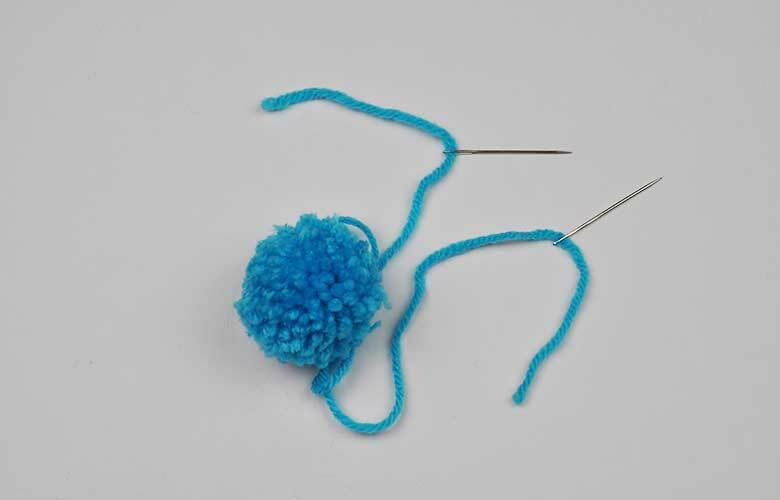 Using your embroidery needles, thread each tail of yarn onto a needle. Tip: I used a DMC threader. It really helped! 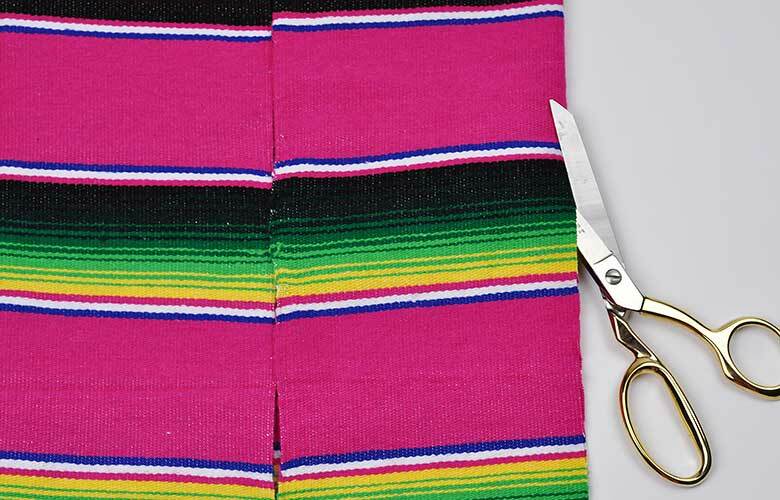 Sew one tail through the serape, and then do the same with the other. This way you have two pieces of yarn sewn through the serape. Tie a double knot on the underside of the runner, and trim off the ends. 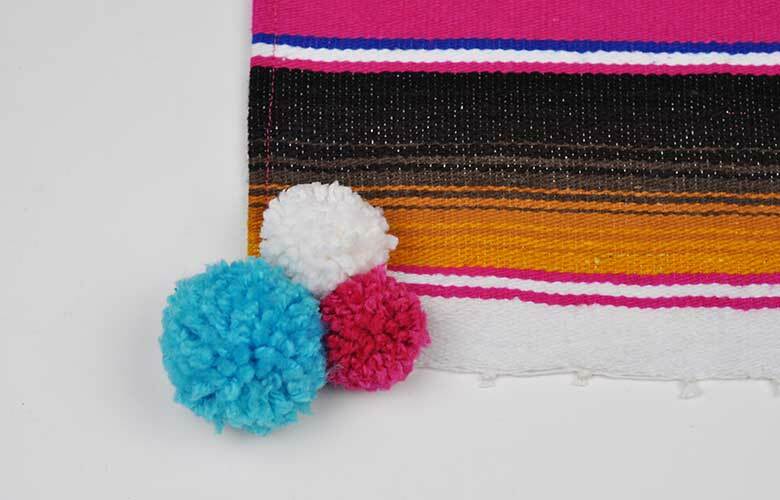 Repeat the above with half of your pom poms until you have a strip of them on the end of the serape. Repeat with the other end. 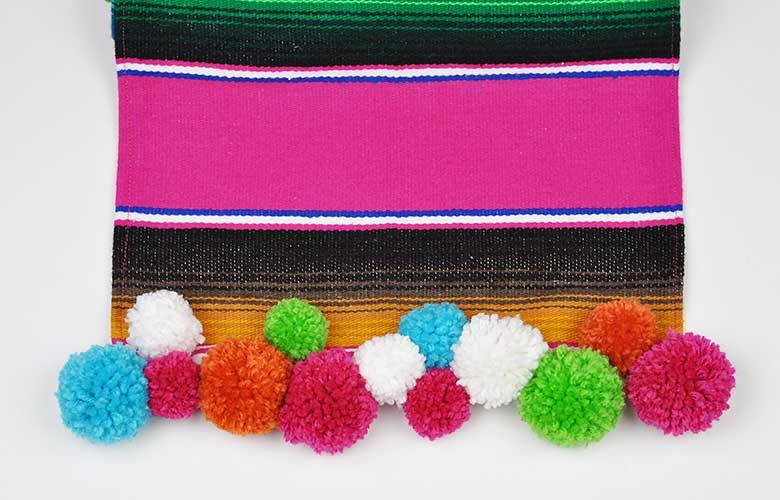 Tip: Place your pom poms out on the table first to see what order you want them in. Then you can take one at a time and sew them on. Ta dah! It’s finished and wrapped up and mailed to Laurel! 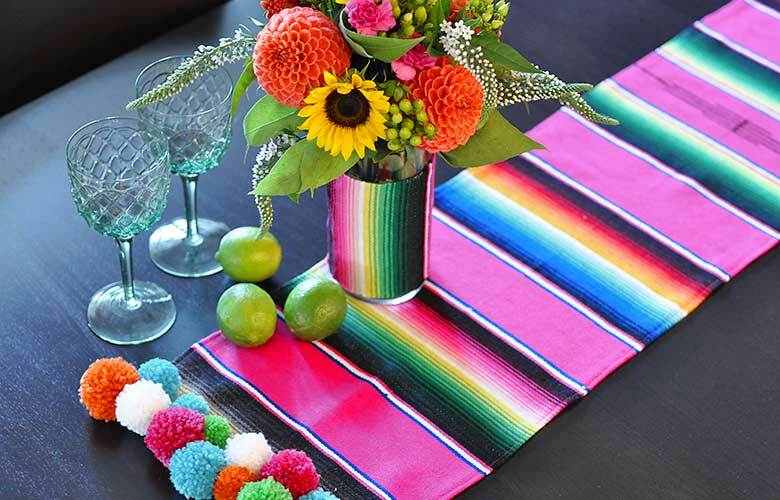 Don’t forget to check out Laurel’s post on the Virtual Dinner Party to see how she styled her table with the Serape Table Runner. Gracias Laurel for this amazing experience!!! Thanks Janet! I would love to do a craft day with you ladies. :) That sounds like a lot of fun! I had so much fun, thank you Kathy! I love how you used the sequin trim too!! This is oh so cute! I’m an editor for Remodelaholic.com and am writing to request permission to use one of your photos from your table runner tutorial in an upcoming post. We would like to feature this in a round up and would include a backlink and clear credit to you.